1 in 4 women (24.3%) and 1 in 7 men (13.8%) aged 18 and older in the United States have been the victims of severe physical violence by an intimate partner in their lifetime. In the state of New Jersey, an act of domestic violence happens every 7.29 minutes. 30% of Americans say they know a woman who has been physically abused by her husband or boyfriend in the past year. Domestic Violence is the largest cause of homelessness in the United States. There are nearly three times as many animal shelters in the United States as there are shelters for battered women and their children. 27% of battered women surveyed said they were prevented from having any access to money by their abuser; 51% lacked access to charge accounts. The cost of domestic violence to the US economy is more than $8.3 billion. This cost includes medical care, mental health services, and lost productivity (e.g., time away from work). In New Jersey, children were involved or present in 31% of all domestic violence offenses. 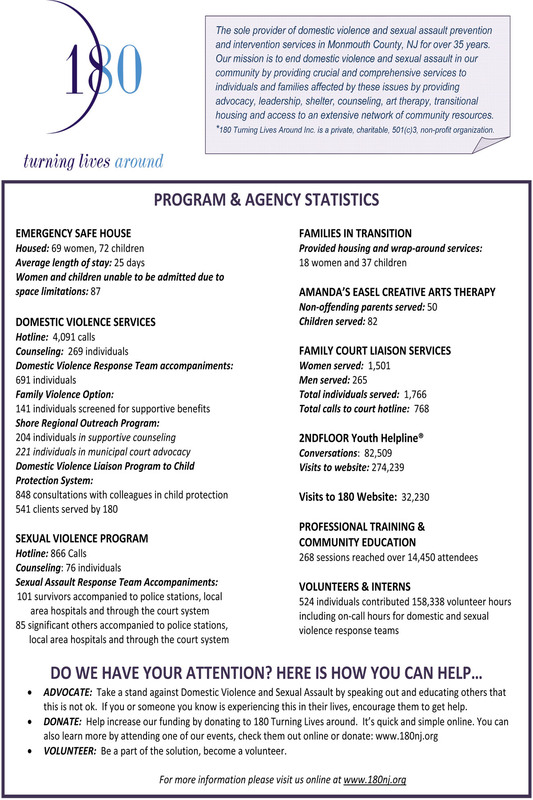 In FY 2012, 180’s Safe House provided emergency shelter to 152 individuals with an average length of stay of 60 days. 185 individuals had to be turned away due to a lack of space. In the last 5 years, 180 turned away over 400 families due to lack of space.